For the first time in recorded history, tonight there will be a “live-blogging” of a “live-blogging” when I “live-blog” the “live-blogging” of the 2006 Spike Video Game Awards, hosted by Samuel L. Jackson. As mentioned in my little bio thing to the right of this posting, this year I was the head writer for the show that is on tonight at 10PM (on Spike). Please watch and talk about how funny you thought it was especially if you’re around someone in a position to hire me. I need to pay off the credit card bills I charged my Wii on! That’s not a metaphor. In the past, the VGA’s have not received a lot of love from bloggers. Actually, if you google the VGA’s, you’ll see that I’m putting that mildly. They hate us. A lot of times, they have some good points. This year however, we tried to put as much comedy in the show and also eliminate a lot of the stuff that really pissed bloggers off in the past (less celebrity acceptances and more appearances by game producers and designers, less hip-hop, etc.) so I’m interested in seeing the reaction the show gets. That’s why I am announcing that tonight, I will be Live-Blogging, the Live-Blogging of the show. It is my impression that this will be the world’s first ever instance of a Live Blogging of something that someone else is blogging live, and I am very excited to make such a precedent. If someone were to Live-Blog me as I was Live-Blogging the guy who is going to be tearing apart the show I just worked on, well that would just maybe blow up the internet. 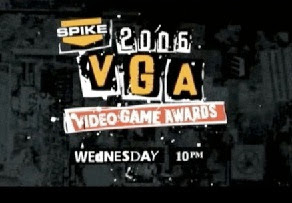 So set your DVR’s that’s tonight at 10 PM on Spike TV- the Spike 2006 Video Game Awards hosted by Samuel L. Jackson.